This has been a crazy year for Rader. Just as the raspberry harvest is peaking, blueberries are starting to come in. Rader did their first full day harvesting blueberries today and several outside growers are starting up too. 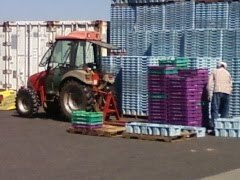 We received our first ever tractor load of blueberries. An outside grower with this small tractor pulled off the Badger with a pallet of blueberry flats on forks behind it. It was quite funny. I had Kirk take the picture with his phone. Since the blueberries are coming in sooner, will the harvest be done sooner? That's what I hear. Brad wants to only do one pass on the blueberries this year insead of the usual three or four. Oh, nice! We'll have you guys sooner, then! !